Troubled with recurring ingrown hair problems? Removing ingrown hair has always been a tricky issue. But not anymore. Here’s why laser hair removal is an effective procedure for getting rid of ingrown hair in no time! 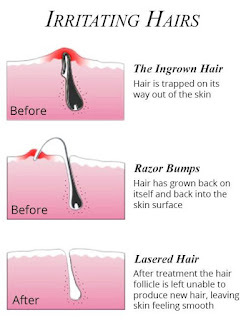 Ingrown hair are often the result of ineffective traditional methods of hair removal. Waxing, threading, and shaving don’t destroy hair follicles and so they can’t get rid of ingrown hair permanently. Undergoing laser hair removal ensures that you effectively remove your ingrown hair along with having a smooth hair-removing experience. It addresses the root of the problem, which is the hair follicles themselves. By permanently disabling the growth of your hair, the issue of ingrown hair is taken care of. Here are some specific reasons why you should opt for laser hair removal for tackling ingrown hair. Laser hair removal works by focusing laser beam at the base of the hair follicle. The radiation from the beam halts the growth of the hair follicle, so that it can no longer support hair growth. Following your session, the hair follicle starts healing naturally. It also helps in getting rid of hair with darker pigments. The procedure takes about 5 to 15 minutes to treat small areas like face, armpits, and bikini line. Bigger areas require longer duration of treatment. The number of sessions you require will be decided by the laser specialist prior to your treatment. This depends upon your skin type, skin color, hair color, and the intensity of the issue. You can read more about what to expect during your treatment with Kaya laser treatment. With the use of latest numbing and cooling agents you can rest assured that your laser hair removal procedure will be a comforting experience. Laser beam targets the base of the hair follicles with minimum penetration on the skin surface. This minimum invasion procedure ensures that you don’t get an infection.